"We saw something mysterious and unexplainable today - somebody wearing Google Glass." I'm not sure why everyone else gave it a miss. Something to do with the train trip I think, which is their loss because the train trip up there was great. The scenery was... well, I think 'lovely' is the appropriate adjective, and the gentle transition from city to industrial to suburbs to towns to fields was a genuine pleasure to watch. Also, surprisingly affordable - protip, don't bother booking online, you get the same price at the station, but do buy return tickets, cause they are literally half the price. I don't understand the economics of offering return and one-way tickets for the same price, but whatever. 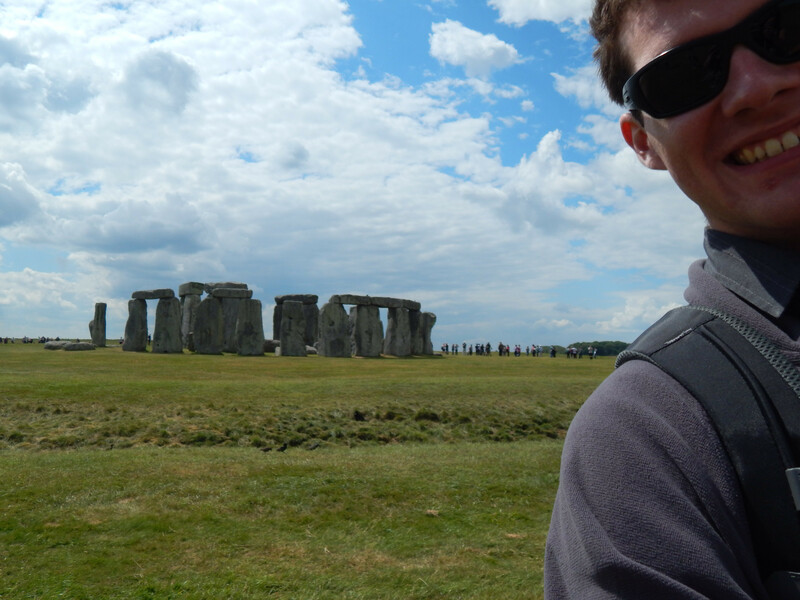 Stonehenge was awesome, and I mean that in the literal sense of the word. It really is ancient and mysterious, and there's something about it which just traps your eyes somehow. I would have gladly stayed there and just looked at it from different angles all afternoon. As it was, I think we probably spent about an hour up there because I got a little sunburnt, but well worth it. If you talk to someone over the age of forty who's been to Stonhenge, you'll probably get the sob story about how Back In Their Day you could go up and climb the stones. And while I think that would have been incredible, I can understand why they fenced it off. The stairs in the leaning tower of Pisa are actually worn on one side from all the millions of feet that have trod it, and while it's true that any individual human will have a minimal effect, if you want what's possibly one of the oldest manmade anythings in existence to stick around for the future, like it should, then you can't let millions of people climb on it. It's pretty tastefully done too - unlike the meridian, I feel like people did get this one, and the site is big enough that it doesn't feel crowded, and - controversial, this - I think sometimes knowing that everyone else is feeling the same baffled awe as you is pretty cool. 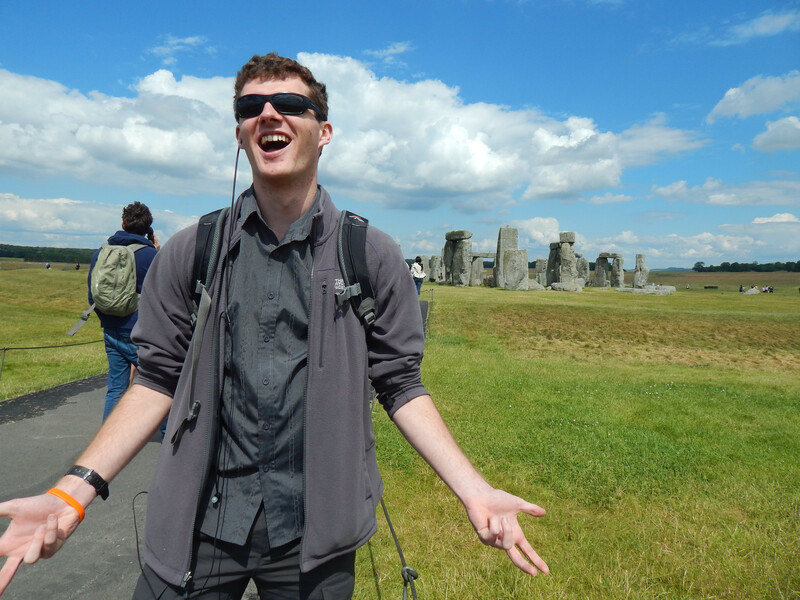 You can't not have that reaction when you see Stonehenge, and being able to share that, even if it is just knowing that a bunch of strangers are feeling the same way, is neat. The audio guide was quite good too, although in truth this was all the audio guide I needed. 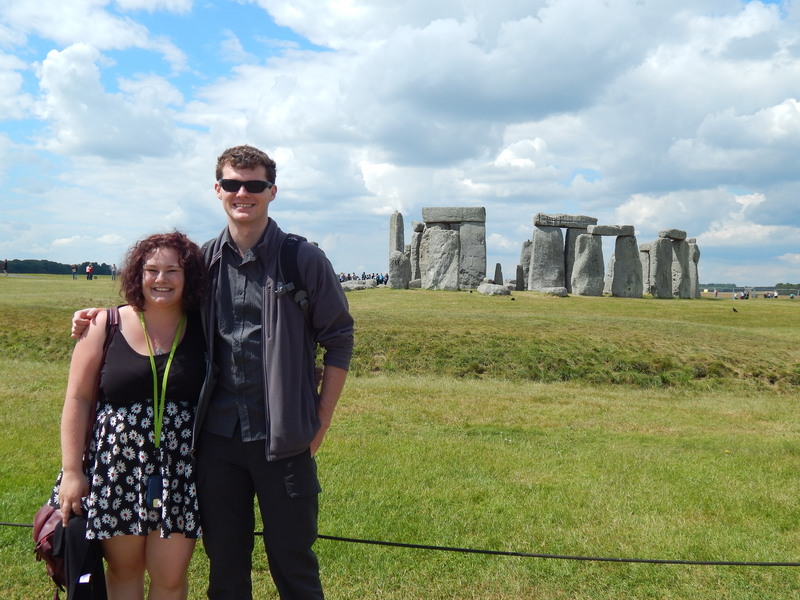 Grace described listening to Stonehenge at Stonehenge as "a religious experience", and I tend to agree there actually. I know it's a comedy song, but it really nails the 'oh wow, what the heck was going on here?' thing with an appropriate amount of awe. One of the striking things about it, or rather its surroundings, is how unremarkable they are. I mean yes, it is a very picturesque part of the English countryside, but there's geographically nothing unique about it. There's no big hill, or majestic cliff - though there is a single natural standing stone on the outskirts. I guess it's like the meridian in a way. People buried their dead there, which made it a sacred spot, so more people buried their dead there, and so on, until Stonehenge. But it's still a uniquely human endeavour, which was only built because humans found it significant, and is only significant because humans built it. There's so much more to see here. It's some of the longest continually inhabited bits of civilisation we know, with some of the most impressive remnants, but it's also just plain nice. I'd like to check out the hill fort we saw on the way at least, and possibly some of the other really old stuff in the area. Also, apparently Salisbury cathedral, which we were unfortunately too late to actually go inside of - has an original Magna Carta on display, which is pretty neat. I reckon this is one part of the world I'll definitely come back to.